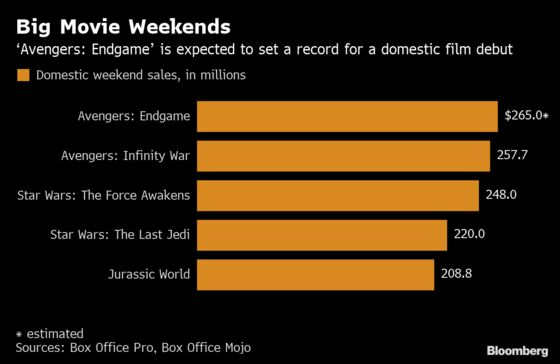 (Bloomberg) -- Early demand for Walt Disney Co.’s “Avengers: Endgame” tickets crashed websites and set records on Tuesday, underscoring predictions that it will deliver the biggest opening weekend of all time later this month. AMC Entertainment Holdings Inc., the biggest U.S. theater chain, couldn’t handle the traffic when tickets first went on sale. Fandango, a top ticket supplier, also struggled to meet demand and had to put customers in lengthy queues before they could order. Even with the glitches, “Endgame” broke Fandango’s first-day U.S. sales record, topping “Star Wars: The Force Awakens” from 2015. Disney’s Marvel Studios also released a new trailer for the film, helping stoke excitement. AMC likened its website crash to the moment in the previous “Avengers” movie when villain Thanos kills half the people in the universe. “We want everyone to be able to grab their Avengers: Endgame tickets, but it looks like we’ve gotten Thanos’ snap,” the movie chain told customers on Twitter. Regal, another theater chain, said sales were outpacing all previous Marvel movies. Within eight hours of tickets being offered, “Endgame” had doubled the entire first week of “Avengers: Infinity War” last year, Regal said in a statement. Box Office Pro also projects $645 million for the film’s full domestic run. That’s short of the $936.7 million record set by “The Force Awakens,” another Disney film, according to Box Office Mojo.